Big Doors gives you larger wooden double-doors. At 3 blocks wide and 3 blocks tall, you can finally have a dramatic entrance on that wall with the odd block-length. Doors come in all six of the vanilla plank styles, based on the new 1.8 door designs. Big Doors is an ADDON for MalisisDoors. You must install MalisisDoors and MalisisCore to use this mod. Big Doors can be automated by powering them from their bottom-middle block. Power sources on any other edge will be ignored. 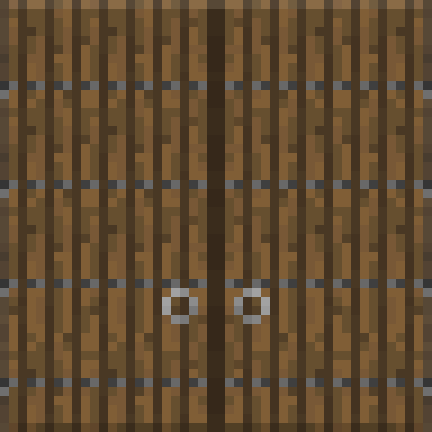 Doors can be crafted by placing two wooden oak doors above two wooden planks of the desired type on a crafting table. Limitations: Like the Malisis Doors "Carriage Doors", these doors do not block arrow projectiles. I can't think of an easy fix, so keep this in mind if there are skeletons in the area. Please update to 1.12.2 since I much prefer these to Malisis' doors texture wise. I also say 1.12 is needed! Is this normal that iron doors do not require redstone signal to open? Yes. The iron is more for aesthetics than an exact 1:1 equivalent with Minecraft doors. Yep, recently i was thinking to myself, why there aren't big doors (2+ block size width) mods available! This is amazing, too bad it isn't for 1.11.2. Would make building a castle with odd-number dimensions so much easier. Santa Claus, bring us 1.12, please. Any hope for a 1.11.2 version of any of your mods besides Storage Drawers? They are all really good.